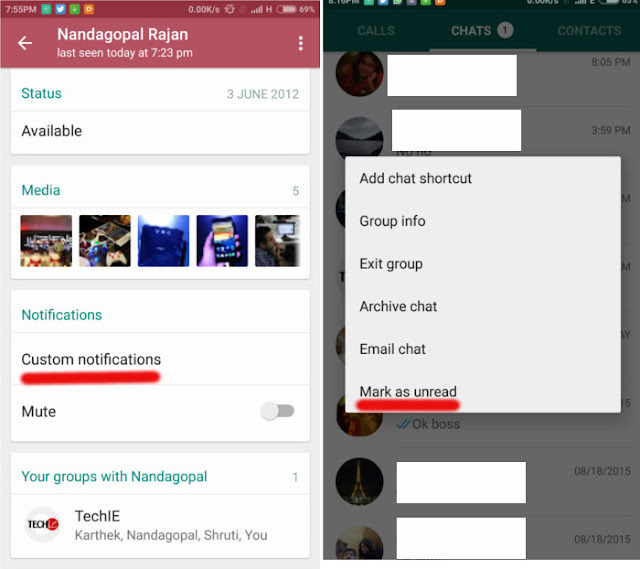 WhatsApp has introduced several new features in its latest update of the Android app. The new features are available on version 2.12.241 and above. The latest update tries to make chats more personal with custom notifications while making it easier for users to keep a tab on their data consumption. However, Google Drive backup is yet to come on WhatsApp. 1) Custom Notifications: Just tap the name at the top of chat to access this new feature. With Custom notifications you can set different notification tone for different people along with ringtones and more. 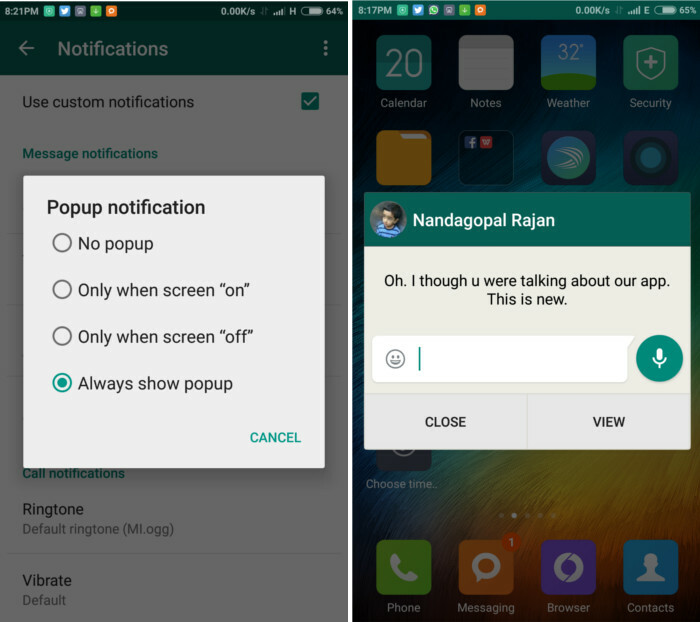 2) Popup notifications: Tired of opening the app everytime you receive a new chat. Now, you don’t have to. Within Custom Notifications you can now choose to show messages in the form of popups and even reply without opening the app. 3) Mark as unread: Now you can mark chats as unread to see or respond to it later. Chats marked as unread are highlighted in the chat list. 4) Mute Chat: Someone is irritating you? Now you can mute individual chats. 5) Low data usage: WhatsApp Calls aren’t free unless you are using someone else’s WiFi. 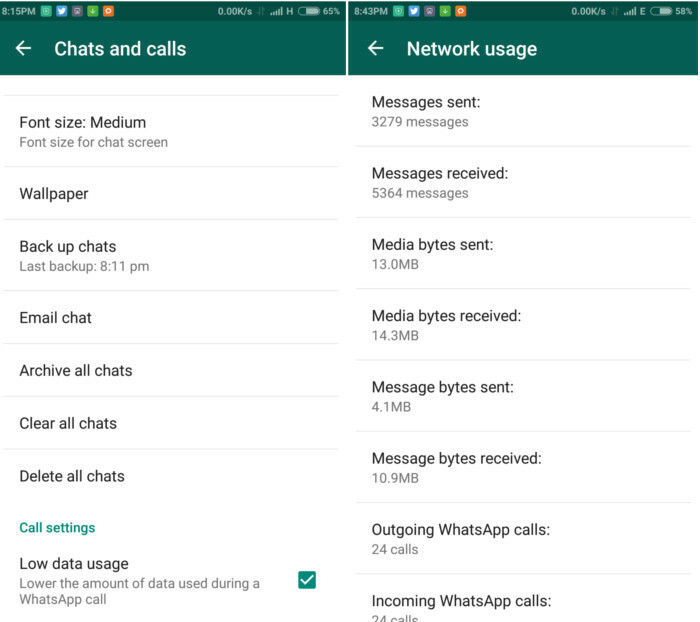 Located under the Calls tab settings, inside Chats and Calls, this feature claims to consume less data during WhatsApp calls. 6) Network Usage: You can monitor WhatsApp data consumption with this feature. Apart from these, the new version brings minor changes to the contact list along with the call interface. Also, don’t miss the new ‘middle finger’ emoticon in different shades. Yet to receive the update ?